Submitted by User on December 18, 2007 - 15:06. 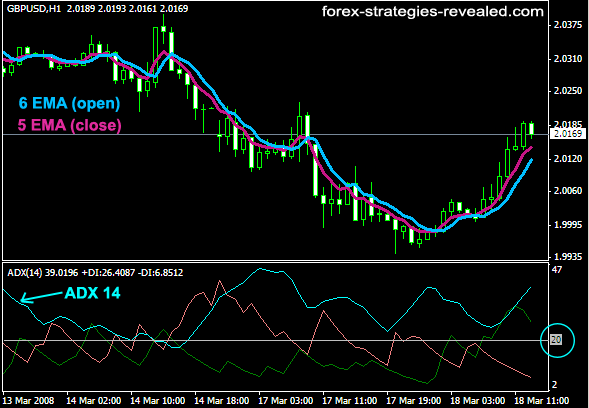 The following Forex strategy was submitted by Egudu - our valued contributor. Thank you once again and let the market be always on your side! Hi, this is Egudu, and i have this simple but efficient strategy and i hope you enjoy using it. Rule: Enter a long position when the 5EMA crosses the 6EMA up and the width difference between them is a pip and the ADX must be over it's 20mark. For those conservative traders, you could add 55EMA and 89EMA to know the trend and only enter a position according to the trend,that's enter long when the 55EMA is over the 89EMA and all other parameters are in place as i have stated above. An update for this system can bee found on: strategy page 4. Submitted by Simon on February 5, 2013 - 12:15. I am trying to create a Ninjatrader script for this exact strategy, but I am having trouble with the ADX confirmation. Could you please post the code you used to achieve this? Many thanks and happy trading! Submitted by User on November 29, 2011 - 07:45. Can we use this sistem on 15 minutes?? Submitted by User on May 30, 2011 - 09:02. I think also..to make a more clear difference.. you can work with 4 and 7 EMAs.. Submitted by User on March 18, 2011 - 10:34.
let us know when you get it up! Submitted by User on October 15, 2010 - 11:09. Hey Egudu(and everyone! ), I have been reading your posts - its interesting to me because just yesterday I developed an almost identical system as you described, I took the best parts of similar systems I found all across the internet after much research, stop-hunting, and article bases, using ADX and EMA's, but I didn't think to use the C.G. indicator, great idea! Anyway, I am a software engineer, and good at MT4 programming, today I am starting an EA for this system here - I would like to collect everyone's ideas on this system, what works best for you, to add all the best indicators together into one EA that I'll program into MT4 and upload for us all. I am going to make this a very fun EA, calling it "Bottle Rockets" strategy, because it reminds me of a rocket launching when the momentum changes, and it launches up off the ground. Also, I have read of other similar systems very similar using a 2-stage buy where one is used to break even, and the other to lock into profits with a 15-pip trailing stop(like a parachute!). I would suggest using a MACD also, as it helps avoiding "fake outs".. Anyway, I have some great ideas to make this an EA like no-other, and there is a lot we can do together to give this superb strategy the edge. So anyone who has tested this strategy, are you willing to help share your best methods you have tested, I'll combine them into an EA and we can work together to refine this Bottle Rocket system. Where should we start, what indicators you had best success with so far? Submitted by User on October 15, 2010 - 10:52. Egudu - I sent you an email but it may have been to your old address, could you give me your current email address? I'm writing an EA for this.. Submitted by Share on July 27, 2010 - 00:00. Thanks for the system.But I have a doubt,what do you mean by 'width difference between two ema is a pip ? Submitted by Edward Revy on September 4, 2009 - 06:50.
indicators and EAs to MT4. Please have a look. Submitted by Claude on September 3, 2009 - 12:40. I have openned a demo with a mt4 platform. I want to test some EA I see on this site. The question is: how do I get the EA to the the proper place? Submitted by Ilya on July 16, 2009 - 13:48. Submitted by Edward Revy on July 11, 2009 - 18:52. ADX line itself doesn't tell us whether it is a down- or an uptrend. It only tells how strong the trend is: ADX above 20 level indicates a strong uptrend or a strong downtrend, below - weak. We use +DI and -DI to determine the trend: +DI above -DI means an uptrend, +DI below -DI means downtrend. Back to you question now: if -DI is on top and ADX line is above 20 mark we have a strong downtrend, time to Sell. Submitted by Kwesi on July 10, 2009 - 15:05. Thanks for the system, but what is the entry rule for a short entry. I ask because the ADX is mostly above the 20 mark, even when the -DI line is above the +DI line, (I think that is the normal thing with ADX). Submitted by Edward Revy on June 4, 2009 - 17:01. 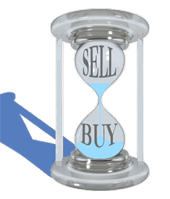 MT4 is the most popular trading platform for automated trading. Ea trading is definitely allowed on demo. On the rest, you've got the point, it is great to be a skillful programmer in Forex, you save time while testing systems, and then eventually get a robot trade for you. Submitted by Claude on May 29, 2009 - 16:09. Does it mean most brokers do not allow this type of trading? Submitted by Edward Revy on May 28, 2009 - 19:32. 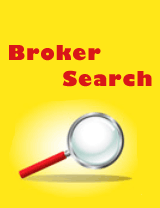 MetaTader 4 allows trading with EAs - expert advisors. These are custom written programs, that will trade instead of you automatically entering and exiting trades according to the system rules built in.